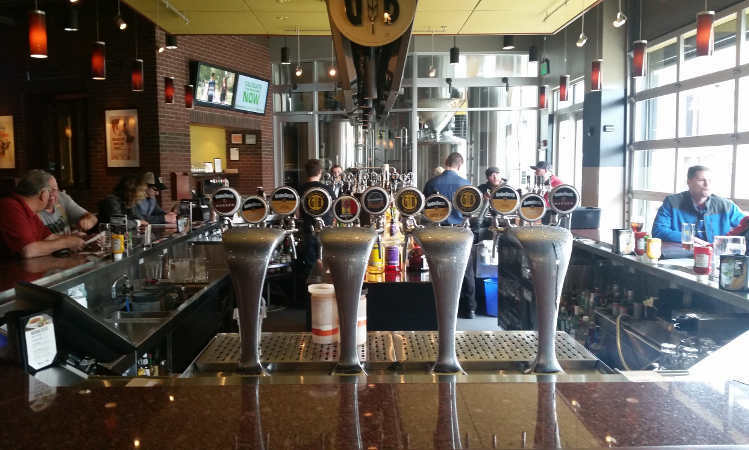 Gordon Biersch is a restaurant/brewery chain with a location at the Galleria Mall in Cheektowaga. 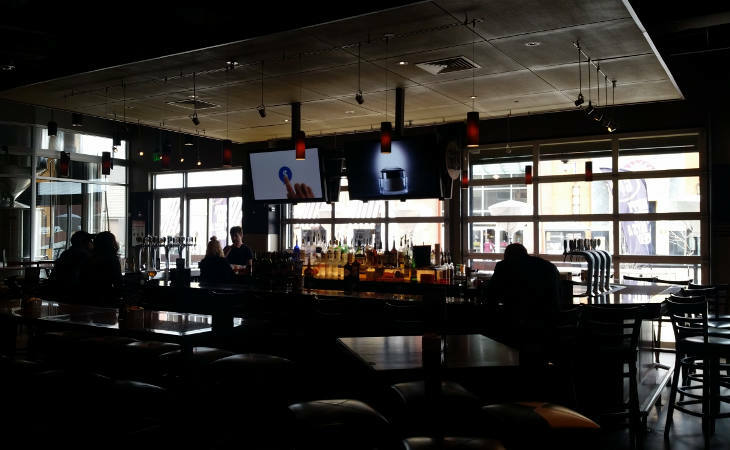 As chains and restaurants at the mall go Gordon Biersch is a pretty cool one – good beer, nice atmosphere and no kids throwing fries in your hair (hopefully). The decor is stylish and probably a little on the top side of casual. There are some flat screens sprinkled about so you can catch a game if you’re stuck, but it wouldn’t be my first choice of sports bar. The original Gordon Biersch was founded by Dan Gordon and Dean Biersch out in San Jose, Cal circa 1988. The group now includes 35ish restaurants/breweries. There are only two in New York -Syracuse being the other. The “authentic” lagers and ales are brewed onsite. They have some good options that change regularly. The waiters and bartenders are well trained describing them, and they’re quick to let you sample a few different options so you’re sure what you’re getting. Gordon Biersch has some excellent beer options and the food is reasonably creative, the menu extensive but not quite as overwhelming as the nearby Cheesecake Factory (emphasis on the word Factory…). Overall it’s a good option if you’re heading to the mall or need a place to hang while your significant other stalks the racks. (For those of you who would rather crawl over 50 feet of glass then spend 15 minutes shopping.) The patio and a cold one and feet up watching the cars go by is particularly attractive in the summer. 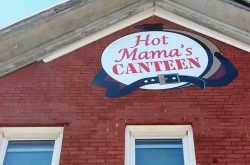 The menu is a hodgepodge of various elements that includes tacos, sliders, nachos, burgers, sandwiches, pizza, chicken, steaks, seafood with the token nod to southwest, Asian and German fare here and there. As mentioned up top the beer lineup changes evey so often. I have to say the IPA was my fav and everything we tasted was pretty much on point. For a beer joint they do have a pretty good selection of wines, mostly from California but not all. I counted roughly a dozen red and white. 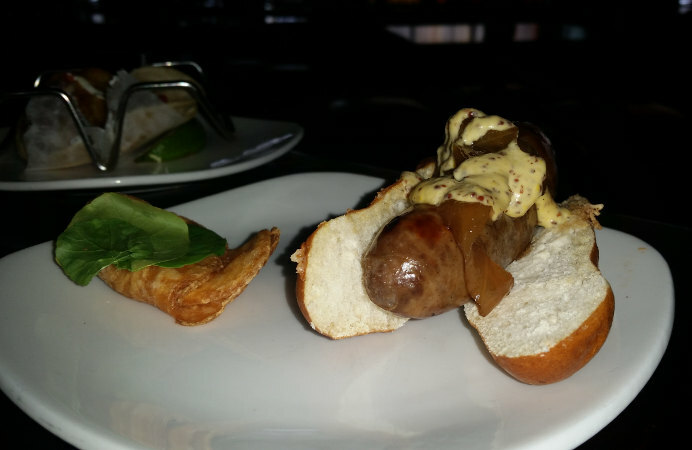 This Gordon Biersch location is also a Healthy Options participant, so if you’re looking to spend a night out without going crazy on calories they have options. Check out the full Healthy Options menu offered below. We stopped for lunch on a Friday to a half full restaurant. The place is pretty slick with stainless steel tanks behind glass brewing up a few batches. The bar is right in front as you enter, with a patio overlooking the walk toward the mall. A separate seating area is beyond the bar seating area. We sat in a booth with three people that is made for three – 1 1/2 on one side and 1 1/2 on the other – meaning it was a little snug. No worries. We ordered a few beers, all three with different preferences. The attentive waiter brought us several samplers from which to make our decision a little easier – much appreciated. 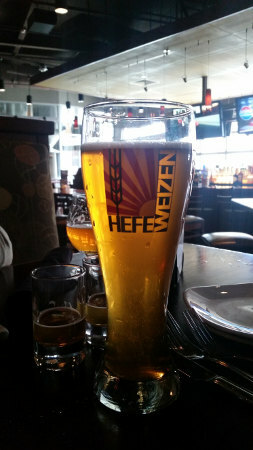 We landed on a Gordon Biersch IPA $5.50, one Hefeweizen $6, one Belgian Tripel $6.50. All good. We were quite surprised at the small portion size here, but as far as taste goes the taco was made with just the right combo of simple ingredients and served in a corn tortilla which is always a plus in my book. When they say mini you better believe mini. Pretty tasty and not bad for a quick bite, but I would have liked a couple more bites. This is a nice appetizer with some quality tuna. I particularly liked the addition of the pineapple. Reasonably priced and sized at $10. This is enough to share with two or three people depending how hungry you are. This is a wayyy better value for your $4. 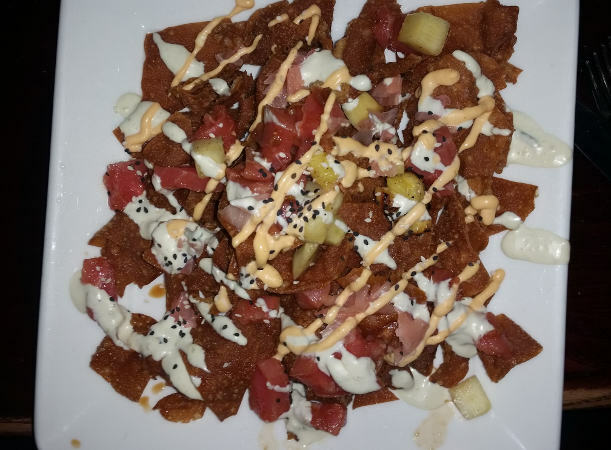 Crispy and flavorful, I’d be willing to get two orders next time around. 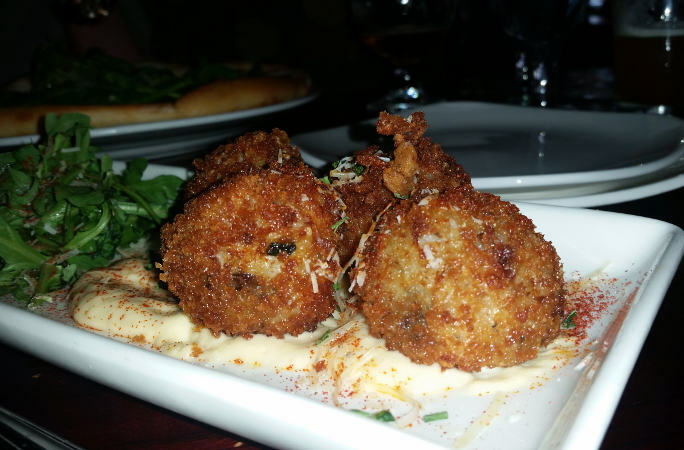 These were a huge hit and the sauce that accompanied the fritters was delightful. 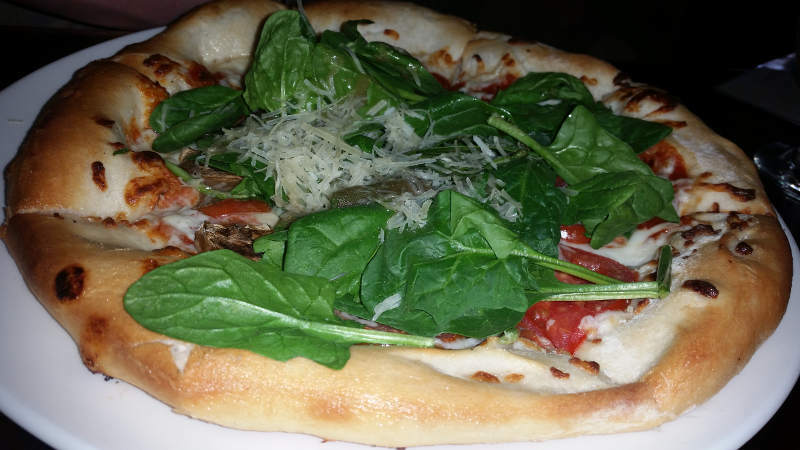 This was heavy on the spinach and full on flavor with a nice compliment of cheese. Probably 12″ in diameter, good for one or two to share for an app. In truth I didn’t notice much artichoke, but I didn’t miss it. I didn’t miss the meat either. 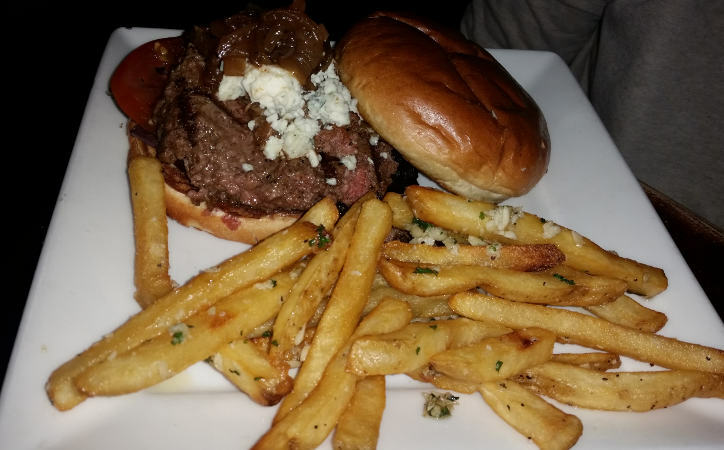 Gastro Pub Burger – Bacon jam, housemade bleu cheese sauce, mixed greens, tomato, gorgonzola cheese and caramelized onions on what they call a “steakburger”, served with garlic fries (or other sides) $12. Bacon jam was a unique twist to the traditional bacon cheeseburger, captured that familiar flavor without all the grease and went well with the housemade bleu cheese sauce. Garlic fries (a GB specialty) were delicious and the size of the burger was big enough for two. This is a good value for $12. What is Healthy Options Buffalo? 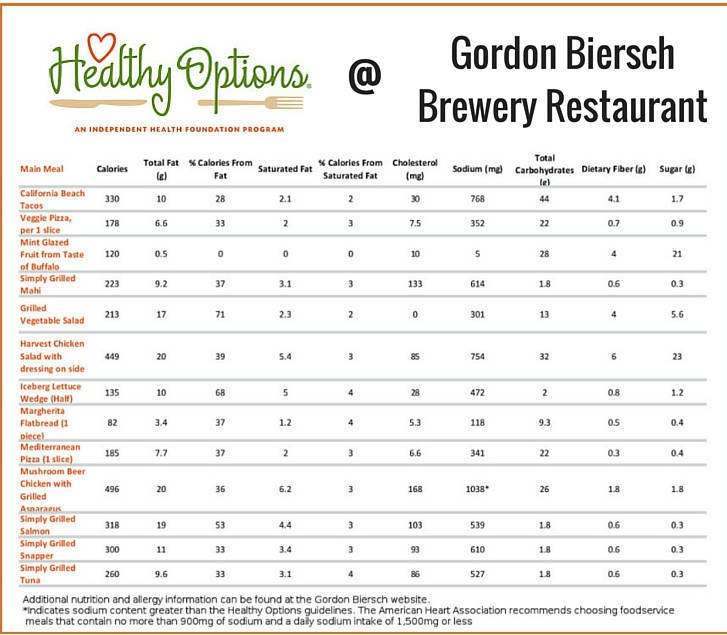 Gordon Biersch is a member of the Independent Health Foundation’s Healthy Options Buffalo program. The Healthy Options program was designed to help our community make informed decisions about healthy eating, and as a result, help address the high rates of stroke and heart disease prevalent in Western New York. 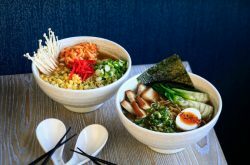 Through this program, the Foundation works with area restaurants to offer heart-healthy food options that are considered lower in fat, saturated fat cholesterol, and sodium. To learn more about the Healthy Options program and to check out more great participating Healthy Options restaurants visit healthyoptionsbuffalo.com.